21+ NJ only. User must deposit a minimum of $10 or more and place first bet on DraftKings Sportsbook. Once first bet is placed, Cold Hard Football Facts will reach out within 24 hours to confirm your subscription. *First bet matched up to $500. Free bet must be used within 30 days of first bet. Free bet amount is not included in any returns or winnings. Free bet is also not redeemable for cash, non-transferable, and non-refundable. Promo ends 12/31/18. See the lines from anywhere, receive exclusive offers, and more. Established, American-born company with over 9 million players worldwide. Advanced security makes it the safest sports betting platform. Proven, industry-leading technology you can count on. Quick and easy to withdraw your winnings. Where is Draftkings sportsbook legal? out to your state representatives. Where can I make a bet? You can only make a bet in a state where DraftKings is licensed for regulated sports betting. Your account will be restricted from making a bet if you are physically located in a state that does not permit sports gambling. If you live in a state where sports betting is not permitted, you can sign up via this link to receive updates on the status of legislation and ways you can help bring sports betting to your state. Why can’t I bet on college sports teams in New Jersey? 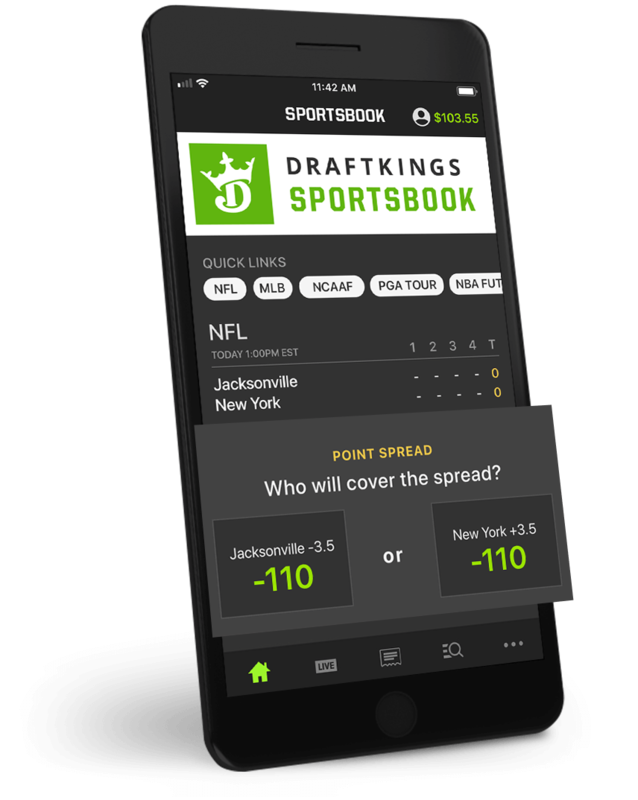 DraftKings Sportsbook users can wager on the vast majority of collegiate teams, sports and events. However, New Jersey sports betting regulations prohibit wagering on collegiate sports or athletic events that take place in New Jersey, as well as any single game events involving a New Jersey college or university team regardless of where it takes place. Why can't I place a bet in a state that allows daily fantasy sports? Sports betting and daily fantasy sports are distinct products and regulated as such. Betting on the DraftKings Sportsbook is currently only available in New Jersey. If you live in a state where sports betting is not permitted, you can sign up via this link to receive updates on the status of legislation and ways you can help bring sports betting to your state.